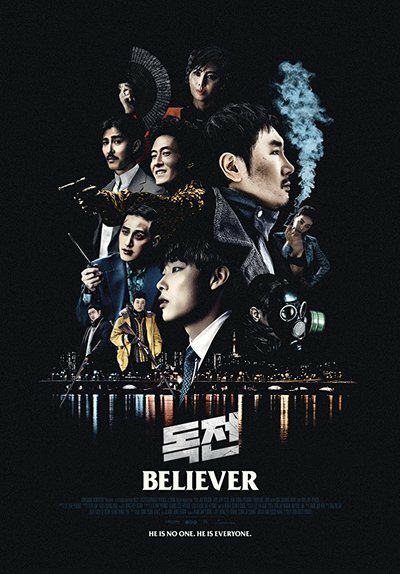 The makers of the Korean crime thriller "Believer"—currently the #1 movie in South Korea for two weeks in a row—invite unflattering comparisons just by choosing to remake "Drug War," Hong Kong action maestro Johnnie To's mercilessly bleak 2012 cops-vs-robbers opus. How do you top "Drug War," a relentless, scathing, and precise neo-noir that condemns pretty much everybody involved in the arrest and sale of drugs in Hong Kong? "Believer" director Hae-young Lee and co-writer Seo-kyung Chung try to reach the same existential conclusion as To's film—everybody is a corrupt middleman, justice is a lie, and there's no such thing as closure—by notably adding more twists, reversals of fortune, and character backstories. Unfortunately, many of these superficial changes distract from the main source of action in Lee and Chung's movie: a convoluted series of pre-drug deal meetings that ultimately lead to an explosive showdown between hyper-focused Korean narc Won-ho (Jin-woong Cho) and the mysterious crime boss known only as "Mr. Lee." Lee and Chung kick off "Believer" by establishing personal stakes that don't really enhance their pulpy scenario. We learn that Won-ho wants to nail Mr. Lee—an elusive drug kingpin that has only been seen by his closest advisers and flunkies—because his sassy junkie informant Soo-jung (Sae-rok Keum) was brutally murdered by Lee's men. Won-ho—a tarnished avenging angel whose motives are barely developed during a misconceived flashback to his Soo-jung's final moments—then enlists the help of baby-faced, servile go-between Rak (Jun-yeol Ryu) in order to facilitate a drug bust that snags Lee as well as the manic, but high-functioning Chinese buyer/user Ha-rim (Joo-hyuk Kim). This process forces Won-ho and Rak to meet up with various unpleasant drug guys who may or may not secretly be Mr. Lee, like mustachioed religious zealot Brian (Seung-won Cha), and mid-tier heavy Sun-chang (Hae-joon Park). "Believer" works best as a series of perpetually escalating confrontations. Many of the big ideas in these tightly-paced scenes are taken whole-cloth from "Drug War," including the amazing scene where Ha-rim forces Won-ho to prove that he's not a cop by snorting two lines of untested designer drugs. This scene works thanks entirely to Lee's sturdy choreography, even if the above-mentioned flashback to Soo-jung's death does ruin the scene's conclusion. Still, "Believer" is generally tense on a moment-to-moment basis. And Kim steals every second he's on-camera as a deeply paranoid psychopathic drug man (he looks and even acts as volatile as Christopher Walken in "King of New York"). So it's entirely possible to enjoy "Believer" if all you want is a collection of anxiety-inducing set pieces where tough dudes double-dare each other to flinch as they talk about drugs, eat human eyeballs, and do some other stuff, too. Then again: Lee and Chung have an annoying habit of trying to explain why antagonists try to cut each other's arms off or apply blowtorches to each other's backs. And unfortunately, a dead girl here and a blown-up cop there aren't enough to convince me that I need to know more about Won-ho and Rak's pre-drug-bust lives. If you want me to care about your protagonists' hopes and dreams, you'd better show me how they respond to each other beyond circumstantial peril. Instead, Lee and Chung deliver a bunch of decent plot-pushing stare-downs that are only effective as adrenaline-delivering devices. And then they ask us to care about what makes these guys tick? Talk about a harsh trip. Lee and Chung don't seem to have a knack for character-driven detail, so most of their heroes and villains behave like every other anti-heroic cop and/or ambiguous villain. Brian's a rote Jesus freak who says "let us pray" right before beating up a colleague in the front seat of a luxury car. Rak's a shy guy traumatized by a dark past (spoiler alert: he was adopted!). And Ho-won is a workaholic who can't stop thinking about a dead girl that we only met in one rather dull scene. By contrast, Sun-chang and Ha-rim—the two supporting characters who are saddled with the least amount of emotional baggage—are just really angry all the time; no wonder they're the best parts of the film. "Believer" doesn't add up to much because Lee and Chung essentially tried to improve something that was already perfectly unsettling. Years of junky genre potboilers may have taught movie buffs otherwise, but: this time, it doesn't need to be personal.